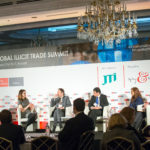 On 21 February 2017, The Economist held the Global Illicit Trade Summit in Brussels, Belgium. The Summit brought together more than 100 high-level representatives including policy-makers, regulators, government officials and members of the private sector. Tobias Freeman, Senior Legal Officer, participated in the Summit on behalf of the Siracusa Institute. The Summit focused on how pharmaceuticals and consumer goods are affected by counterfeiting, but also touched on a wide range of other issues related to the Siracusa Institute’s program on illicit international trade. There was broad consensus that current approaches to tackling illicit trade are inadequate. Panelists emphasised the important work still to be done in studying the evolution of illicit trade, as well as boosting capacity in and enhancing international cooperation between prosecution, law enforcement and customs agencies, which are areas of particular interest to the Siracusa Institute.